As the launch of the Galaxy S9 approaches, it’s natural for the leading accessory sites to get ready for the new device. MobileFun is one of those sites and it has sent over some exclusive videos of the new Clear View stand cover and LED Flip Wallet cover in action. One of the first things you want to do when you receive your brand new shiny device is to protect it with a case so it’s a great move that you can pick up a cover to protect the Galaxy S9 even before its release. 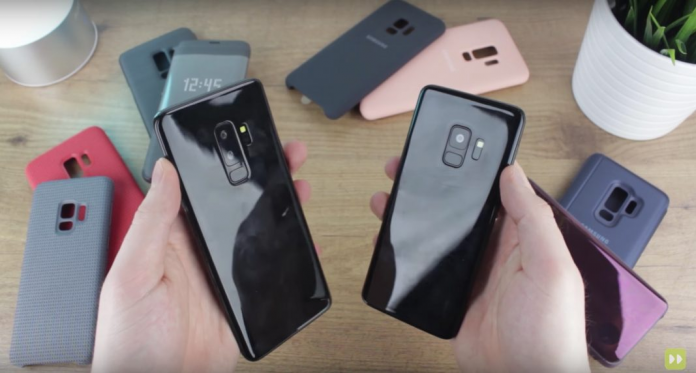 The video shows off the official cases and the rear camera design, as well as the overall look and feel of the Galaxy S9 itself. You’ll specifically notice the shift in fingerprint reader location that is now placed under the camera to provide a more accessible and comfortable feel. The LED View cover is similar to previous iterations we’ve seen, whereby a series of dots make up a matrix that projects things like the current time, notifications, calls, etc. through the case to avoid the need to open up the cover to see vital information. However, instead of the usual synthetic leather, it is now made of a woven fabric that makes it look a lot nicer. MobileFun also shows off the new Hyperknit cover, which is especially nice in my opinion. It looks to add a substantial amount of grip to the Galaxy S9 without any noticeable bulk. If you’re looking for something a little different, MobileFun has compiled a round-up of cases for the Galaxy S9 and Galaxy S9 Plus. The two cases are already available on MobileFun’s online store, with the LED Flip Wallet Cover costing $69.49 while the Hyperknit Cover case costing $34.99. You can also view our full range of Galaxy S9 and Galaxy S9 Plus here.